These are our favorite KA Premium Bamboo knitting needles in an exchangeable set. 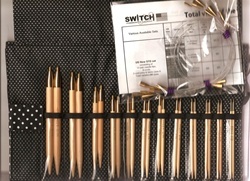 12 Pair of Bamboo Circular Needles and 8 cord sets make all kinds of sizes!! Cord Lengths 8"(3), 16" (3), 21", 28"
This set is packaged in a padded cloth case with velcro closure. Very compact, about 6"x 8"x 1". Made in Japan, these bamboo needles are stronger, smoother and longer lasting than other bamboo needles because of their hard finish that saturates the bamboo, not just the surface. so the cords never twist. Extra Cords, Needles sized 4-15, and stoppers may be purchased individually.